This week, three new flicks join our Long Range Forecast as the early new year's release calendar continues to take shape. Hansel and Gretel: Witch Hunters, Movie 43 and Parker are currently scheduled to open on Friday, January 25, 2013. - Jeremy Renner's profile continues to rise after The Avengers and The Bourne Legacy. - Will get a bump from 3D and IMAX admissions. - Do that many people really want to see an action film set in the universe of Hansel & Gretel? - Likely to be extremely front-loaded towards opening weekend given its fanboy driven nature. - Will be some audience crossover between it and Parker. - A large ensemble cast having fun could appeal to a number of different audience demographics. 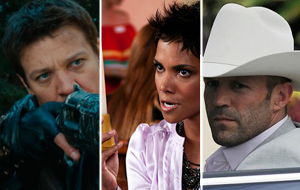 - January is typically a good time of year to release comedies. - The fragmented nature of the film may prove to be a major selling point. - It is also possible that the fragmented nature will keep more moviegoers away than it draws in. - Opens just two weeks after A Haunted House. - Jason Statham is a very consistent performer at the box office in starring roles. - The presence of Jennifer Lopez could help the film expand a bit beyond Statham's usual audience. - The presence of Lopez could turn off some of Statham's usual audience. - Will be some audience crossover between it Hansel & Gretel: Witch Hunters. - Will also face competition from Broken City and The Last Stand, which will be in their second weekend of release. Notable changes on our forecast this week include Playing for Keeps. Gangster Squad Jan 11, 2013 Warner Bros.
Shawn Robins, Daniel Garris, Phil Contrino and Alex Edghill contributed to this report.